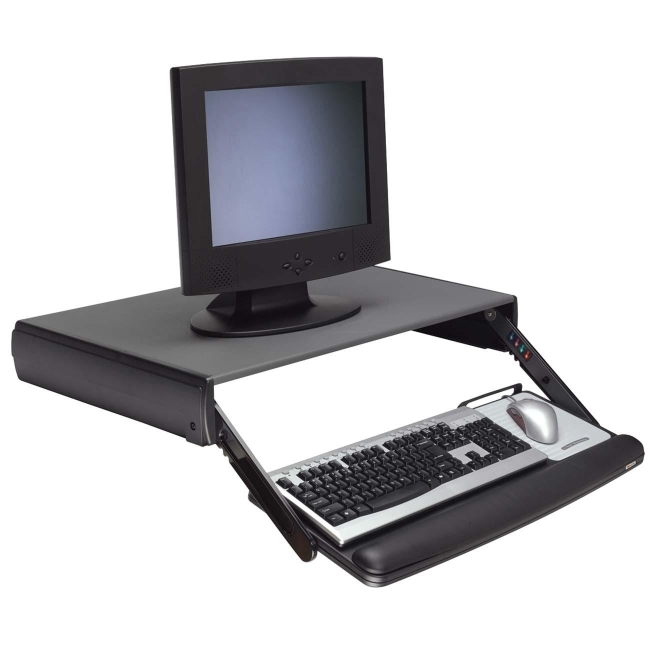 Adjustable Desktop Keyboard Drawer is designed for use with corner or standard workstations. Requires no underdesk space to use. Low 4" profile for better monitor height. Platform adjusts 3/4", 1-1/2", 2-5/8", and 3-3/4" below work surface. Tilt adjusts positive 30 degrees/negative unlimited degrees. Wide platform places mouse next to keyboard for added comfort. Mousing surface can be used to the left or right of keyboard. Includes full-width wrist rest with antimicrobial gel and Precise Optical Mousing Surface. Keyboard Drawer offers durable steel reinforced construction. APTA endorsed. Accepts keyboards with maximum height of 1.5"